um ein Gewerbe im Bereich Gesundheit zu betreiben. Bisher haben noch keine Kreditgeber ihre Unterstützung zugesagt. Juan benötigt für dieses Geschäft noch 1325 US-Dollar. » Schon mit 25 US-Dollar können Sie Juan unterstützen! Geld wird für Juan gesammelt. Juan is a 73-year-old man. He's married but never had children. 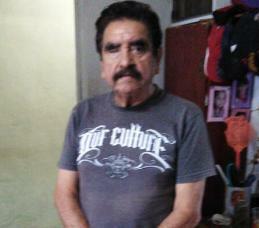 He has lived for 40 years in his native Guadalajara, Jalisco. He has a small business that's his source of income for getting ahead with his finances. Juan was diagnosed some time ago with a chronic degenerative ailment that has affected his vision. He lost the sight in his right eye and now has problems with his left eye because of this illness. He needs an operation so his vision does not continue to deteriorate. Unfortunately he has no way to cover the operation in cash, so he requested a loan to be able to get the surgery as soon as possible without affecting the family budget. He's confident that soon he'll be able to recover his eyesight and that way have a better quality of life.